Chaque chambre et la porte avant est équipée d'un système de sas d'entrée numérique. Chef privé et extra services rendus sont disponibles sur demande. Grande massages sont un pâté de maisons. Guadalupe église 3 blocs de là, fait une messe en anglais au moins tous les dimanches. 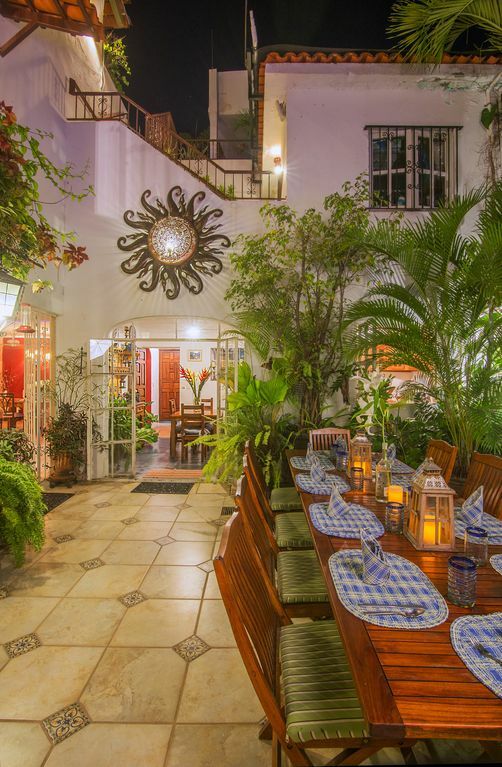 The best part of staying in the beautiful Casa Romance Escondido was being in the heart of it all. Two blocks from the center of the Malecon (boardwalk), steps away from Café Des Artistes (rated one of the best restaurants in Mexico), in the middle of participating art galleries for the Art Walk (Wednesday evenings) and right down the hill from the Mirador Cerro De La Cruz lookout where you can enjoy wonderful views - the climb is worth it! The owner (Guy), Fidel and the housekeeper were all very kind and concerned that all our needs were met. Thank you! This house is the most wonderful place we have ever stayed! We would come here again in a heartbeat. We had a wonderful stay here with five siblings and our spouses. The Casa is centrally located several short blocks from the Malecon, with resraurants, bank, and all amenities nearby. The Casa itself is spectacular. Four spacious bedrooms with en suites, air conditioning, and king beds. Gorgeous view of the bay from the terrace. Lots of comfortable sitting space for socializing. A hot tub to relax in. There's maid service, and all necessities are supplied. Many green plants add to the decor. All in all, a fabulous stay. Thanks, Guy, for your hospitality. The house is really nicely laid out for maximum privacy for groups and families. My problem with it is the condition. It needs updating, for instance, the living room furniture is unusable. The couch is lumpy with what feels like metal bars and the chairs are the same as to comfort. My largest complaint, however, is the lack of a dishwasher. We are not clean freaks by any means but when a home is rented out frequently and is supplied with silverware, glasses and cups, it needs a sterilizing dishwasher. Also, during our stay, we had a leak in the master bathroom as well as protrusions (something leaking through) in the walls in the bedroom, none of which was repaired. For the price, we felt it should reflect more care. We have visited Puerto Vallarta many times and stayed in a number of VRBO houses so know a little about the market. The housekeeping was fine as was Fidel who was very nice and helpful. We were a group of 7, and had perfect accommodations at Casa Romance Escondido! The house is close to the action in old Puerto Vallarta. Guy and Fidel were very kind. We would definitely stay here again, and highly recommend it!